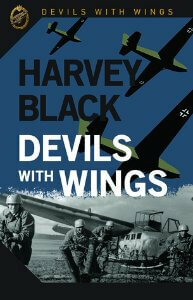 Harvey Black is the author of the Devils With Wings series and The Red Effect, the first of a new series of novels set during a fictional Warsaw Pact invasion of West Germany in 1984. He is a qualified parachutist, and served with British Army intelligence for over ten years. 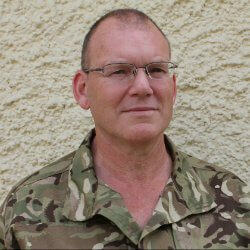 Russell Phillips: Can you give us a brief summary of your career in the army? Thank you for the invite. I joined the Army in 1979, so my service was very much focussed around Northern Ireland and the Cold War. 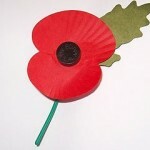 I cut my teeth in the Army with an Armoured Brigade in West Germany. I did three tours in NI, one conducting covert surveillance around Belfast and the other two as a Liaison Officer. For that I travelled around NI, visiting various Army units, coordinating the use of the Intelligence resources available, such as the RAF and Army Air Corps. I remember one tour I had a gold coloured Ford Capri (Except for going to Crossmaglen, that was by helicopter). I used to carry a Walther PPK, 9mm Browning and a Remington 7-shot shotgun (or alternately an MP-5) for protection. The Cold War element consisted of Intelligence gathering in East Berlin during the 80s, where I was dragged from my vehicle and attacked by KGB soldiers, and covert surveillance in West Germany against KGB, Spetsnaz sleepers and the like. RP: I read several books based around the idea of the Cold War turning hot during the 1980s, when such a scenario seemed like a real possibility. There seem to have been very few written since then, presumably because it changed from “potential future” to “alternate history”. Do you have any concerns about writing The Red Effect series as alternate history? HB: only in that people can get hung up about the accuracy surrounding the reasons behind the event kicking off. But, It is a novel after all, and about alternative history. It is not meant to replace a solid piece of political analysis of world events at that time. Very difficult to apply complete accuracy to a hypothetical subject. I do try and attain accuracy and realism around the basics though. I wanted to write a novel to entertain, leaving the higher level political novels to the likes of General Hackett. RP: There seems to be an emphasis on British units and the British area of operations in The Red Effect. As a Brit myself, I found it a welcome change to the more common US-centric narrative. Was that a deliberate decision, or simply due to a better knowledge of British equipment and procedures? HB: A number of reasons. There are so many different countries and so many different units that would have been involved in a potential conflagration. There was a danger that my novel could turn into a tome. Also, spreading your story across too many different organisations and characters could leave the reader having to frequently flick back through the novel just to reacquaint themselves with units and characters. Yes, my experience is very much based on British and Soviet Forces. RP: The Red Effect is set in 1984. The Soviets have relatively new equipment (T-80, BMP-2) but NATO has some earlier equipment (The British have a mix of Chieftains and Challengers, the American M1s have 105mm guns, etc). Do you think this is the period when an invasion was most likely to succeed? HB: Yes I do. At that time, the Soviet Army was at its largest and was continuously introducing new and better equipment. The spend on their forces was in the region of 20% of their GDP, a level that was slowly crippling their economy. The bulk of their industrial infrastructure was geared towards the military, as a consequence their civilian industry lagged behind that of the West in both productivity and quality. The late 80’s, as we all know, was very much the turning point for the USSR. RP: Where did the title for The Red Effect come from? HB: I naturally needed to get the word RED in somewhere, but wanted to come up with something unique. There are so many similar titles out there. As it was always going to be a trilogy, I needed a title that could be altered slightly, yet still link into the previous novel. RP: Do you have release dates for the remaining two books in the series? HB: The Black Effect will be out on 14th September and The Blue Effect next year. 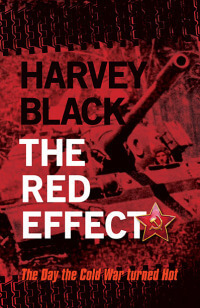 The cover of The Black Effect was revealed on harveyblackauthor.org on 16th August. RP: Can you tell us what you’ll be writing once the Red Effect series is complete? HB: I will definitely continue with the Devils with Wings series. There could be as many as ten in total. But, after The Blue Effect, I will also start on an Apocalyptic series….post a nuclear war. No Zombies! But, it will still be dark and high-octane. After a nuclear strike on the UK, all the social and political rules, along with the rule-of-law, will fundamentally change. Already planning the layout and excited about writing it. RP: I haven’t read the Devils With Wings series. WWII isn’t a major interest of mine, though certain operations such as the capture of Eben Emael are fascinating. Why I should read it? RP: I’m always interested in finding new authors and new books. What single author, book, or series would you recommend I take a look at? HB: I have to fall back on my favourites, and that list will never change. The Forgotten Soldier, by Guy Sajer (superb), Alexander Kent, CS Forester, Simon Scarrow, Bernard Cornwell and of course The Lord of The Rings. HB: Thank you for the invite. One of the great things about Social Media, it gives writers an opportunity to engage with their readers. Thanks again Russell.